In the modern times where hand craftsmanship and personal customer-oriented service seems like an impossible find. Alex Ostrogradsky’s engraving services offers clients a level of hand craftsmanship and personal service rarely found today. Weather you are looking to engrave or restore vintage or precious metal item, over 30 years of experience in metal engraving and jewelry making work together to produce the highest quality results. All of the engraving work displayed on this site is just a small part full portfolio of hand made and engraved jewelry made by Alex Ostrograsky. Engraving is one of the oldest art skills known to man and one which has come down through the centuries gaining in excellence, popularity and prestige. If we read the traditional story of prehistoric man down to and including the men of the stone age we learn that back in those dark ages when no other implements or tools were known save those made from stone, some of the men of the period were spending their leisure time whittling weapons and engraving on stone the forms of animals with which they were familiar. Most engraving is done by laying out a sketch of the general outline onto the metal first. This is commonly referred to simply as etching. After this step is complete the artist can move to strictly engraving the work. Though simple enough as regards the mere process in practice engraving demands a peculiar dexterity. When the outlines of the drawing that is to be copied have been traced and transferred to a plate usually made of precious metals is carved with a sharp tool called the dry point. Then the trenches are marked out and deepened or fresh ones are made with the graver which owing to its shape produces an angular incision. The appearance of every object represented in the original must be reproduced solely by these incised lines at different distances apart or tending in various directions or by dots and cross hatchings. Even though the modern tools made engraving much more precise, in addition to the difficulties resulting from the use of a engraving tools one must mention the unavoidable slowness of the work and the frequent impossibility of correcting faults without having recourse to such drastic remedies as obtaining a fresh surface by re-levelling the metal where the mistakes have been made. So even in todays word the art of engraving takes a life time to master. For centuries people have used engravings to embroider their possessions with personal marks or crests. As the art of rendering designs on jewelry. 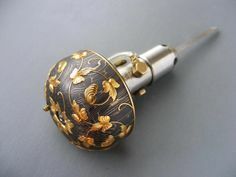 The engravings were also used to enhances and beautify especially prized items made out of gold, silver, platinum and other metals. It enhances the beauty of the item and creates awe. With the increasing demand for such intricate hand made work, the art of engraving continues to prosper and skilled craftsmen are in demand.